Microsoft could quite literally have a small treat lined up for fans of its Surface tablets in the run up to Christmas, if one tech tweeter is to be believed. According to a tweet by TK Tech News, the software giant has resurrected the long-rumoured Surface Mini and is getting it dressed up for shelves in time for the holiday season. It reckons that the device will launch alongside the Surface 3, which would succeed the Surface 2 that was announced back in September 2013, and the Surface 2 4G that followed six months later. We're going to take the rumour with a punch of salt. 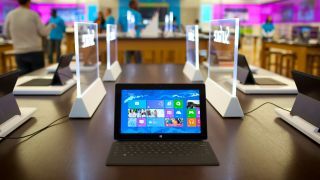 The Surface Mini was last seen kicking its heels in the back pages of the Surface Pro 3's manual following Microsoft's decision not to launch the two devices at the same time. Not much has been said about it until last month when one particular tech website claimed to have laid their hands on one like a giddy child hugging a puppy. With the Surface Pro 3 still in full flow having picked up mostly positive reviews following a global release in August, and Windows 10 not set to appear on devices until well into 2015, it would seem unlikely that new hardware will emerge from behind the curtain over the next few months - but we'd be happy to be proved wrong.